When you purchase a CNC Router from Thermwood, a five-day comprehensive programming/operation training course for two students is included. This course is conducted at Thermwood's state of the art Dale, IN facility. 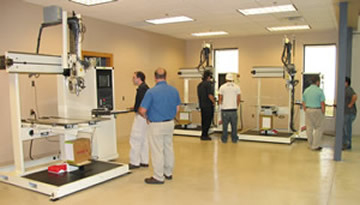 Training at Thermwood is conducted in a modern, comfortable and well equipped center devoted specifically to educating our customers. This is, by far, the fastest and most efficient way to learn. Over the years, Thermwood has experienced the ups and downs of training at the customer's facility, the interruptions and distractions, not to mention the lack of classroom facilities and equipment. It just doesn’t work very well. At Thermwood, the atmosphere contributes to the learning experience. Each classroom is setup specifically for the course being taught. Our machine operator/programmer courses are located adjacent to the machine training lab, where students complete the prescribed projects on a specific training machine utilized only for training purposes. 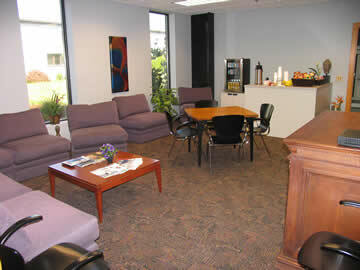 Our application software classes are conducted in a classroom with state-of-art computer equipment. Then when it comes time for practical applications on a full sized machine, Thermwood's training lab is equipped with a CabinetShop 45 outfitted with all major options and features. Real production type parts are cut. What a confidence builder! 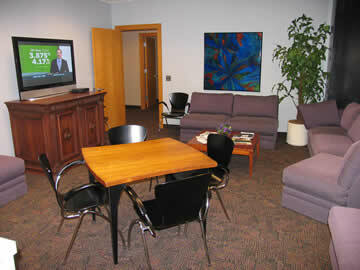 Lounge area with plenty of seating and satellite-equipped large flat-screen tv for your use. For more information on our machine training or about any of our products, please email us at sales@thermwood.com or give us a call at 1-800-533-6901.